^ Pursue a faith that counts. Numbers can be deceiving. The book of Numbers opens with a count of every person fit to serve during the Israeli's exodus from Egypt. Yet while over 600,000 were counted, only two were allowed to enter the Promised Land. The lesson? God values quality over quantity. And as the next generation finally experienced God's promise, we discover that He doesn't just want us counted as believers, but as people He can count on. Part of Dr. Warren W. Wiersbe's best-selling "BE" commentary series, Be Counted has now been updated with study questions and a new introduction by Ken Baugh. A respected pastor and Bible teacher, Dr. Wiersbe explores how we can make our faith matter. You'll be encouraged to trust His word, and inspired to count on God, while counting for Him. In God's kingdom, quality is greater than quantity. Based on the book of Numbers, this practical study and Bible commentary encourages us to pursue a faith that counts. 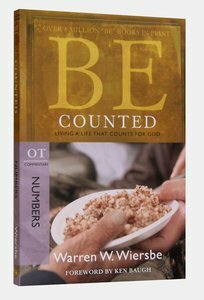 About "Be Counted (Numbers) (Be Series)"
Warren W. Wiersbe is a pastor, author, and editor of more than one hundred books, including 50 People Every Christian Should Know; The Dynamics of Preaching, and Through the Year with Warren W. Wiersbe, along with the highly popular BE. Today his primary ministry is serving others through writing, teaching, and speaking at conferences. For two decades, Dr Warren Wiersbe's Be Series has been a global mainstay of popular Bible study helps. Now updated with study questions and new introductions, these multi-million selling commentaries provide invaluable insight into the history, meaning and context of every book of Scripture! Order now to secure your copy when our stock arrives. 0 Available. Expected to ship June 2019. Think of Ruth and Esther, two Old Testament heroines of the faith. Singled out as the only women to have Bible books named after them, Ruth and Esther lived in very different worlds, one a poor peasant and the other a powerful queen. Yet both dared to do the right thing when confronted with the easy way out, and God rewarded them for their courage and commitment. As you study the Books of Ruth and Esther, you will appreciate anew the tough choices of faith these women made, and you will be encouraged to do the same as you rely on the God: who accomplishes His purposes through people who trust Him.